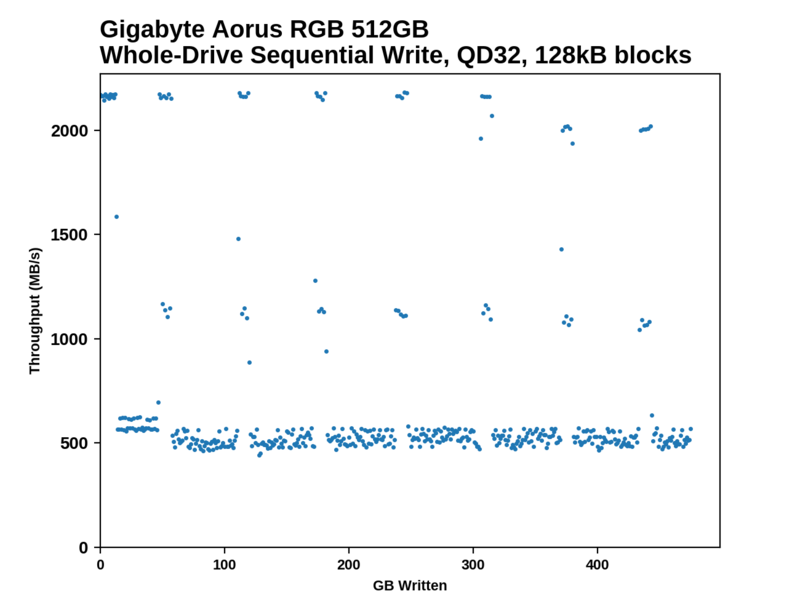 The GIGABYTE Aorus RGB SSDs show the same general behavior as other Phison E12 drives during a drive fill operation. The SLC cache keeps write speeds high for the first few GB, then the drive drops down to a much lower speed. The SLC write cache is periodically emptied, giving brief bursts back up to full speed, or nearly so. The smaller drives show longer garbage collection cycles than the 1TB models we've previously looked at, and combined with their smaller capacity this means that there are far fewer high-speed bursts while filling the 256GB model than a 1TB drive. 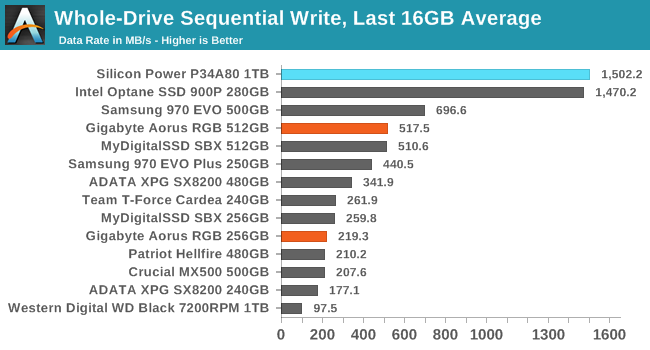 Both peak and baseline write performance scale with drive capacity, though the 256GB model's baseline performance is a bit better than a linear trend would predict. The initial SLC write cache sizes appear to be about 7GB for the 256GB model and about 13GB for the 512GB model, compared to about 20GB for the 1TB Silicon Power P34A80. The long-term sustained write speeds from the Aorus SSDs are reasonable for their respective capacity classes. The 512GB model is about 15% slower than the Samsung 970 EVO but outperforms the ADATA SX8200, while the 256GB model trails its Samsung competitor by a bit more still stays ahead of the SX8200 and the entry-level NVMe drive. 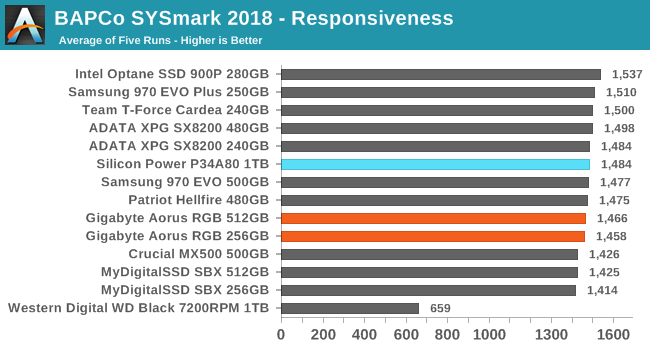 The SYSmark Responsiveness scores for the Aorus SSDs are a small step up from the Crucial MX500 SATA SSD or the MyDigitalSSD SBX entry-level NVMe drive, but the Aorus doesn't outperform any other high-end NVMe drives. The Creativity and Productivity scores show almost no difference between the SSDs in this batch, and consequently the Overall scores are also closer together than the Responsiveness scores. 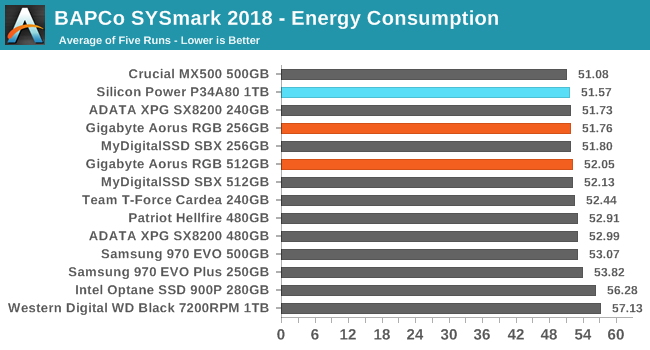 The Aorus SSDs have relatively good energy consumption scores for the SYSmark test, though not quite as good as the Crucial MX500 SATA SSD. The Silicon Power P34A80 unsurprisingly uses a bit less energy than the Aorus since it is based on the same controller but with enough capacity to reach its full performance potential, and it lacks the LEDs that the Aorus SSDs have. The Samsung 970s are relatively power-hungry for M.2 drives.